A while back Matt tore a muscle in his calf, and he’s been limping around ever since. He can walk short distances, but ideally wouldn’t be walking as much as he is, and that’s slowed his recovery. He hasn’t been able to ride his bike for at least two weeks. He’s not happy about it. Our son’s school is on the way to Matt’s office (more or less) so normally they ride together, Matt drops him off, then continues on to work. 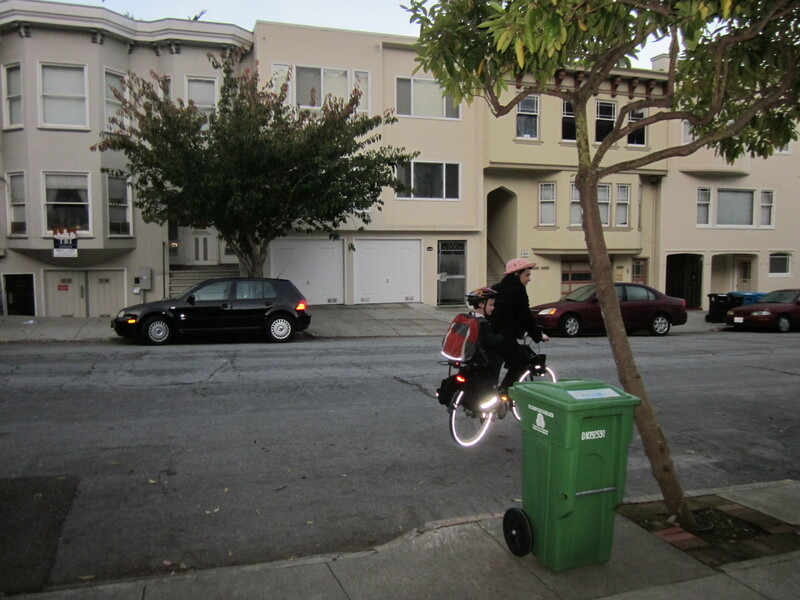 He also typically does the pickup at after-school, and they ride home through Golden Gate Park. The MinUte is always ready to pop a kid (or even two, if they’re old enough to hold on) on the back. So for the last couple of weeks, I have been doing most of our son’s drop-offs and some of the pickups. It’s been nice to have this extra time with him in the morning. I hadn’t used the Bobike Junior regularly; it pops on and off the bike in less than a minute, and for regular commutes it is mostly off. But for the last week it has been on my bike full-time. On our morning rides, we bomb down the hill from our house as a starter (no worries: the neighbors already have Child Protective Services on speed dial) and head into Golden Gate Park, over to the Panhandle, then up to Alamo Square and back down to Japantown. 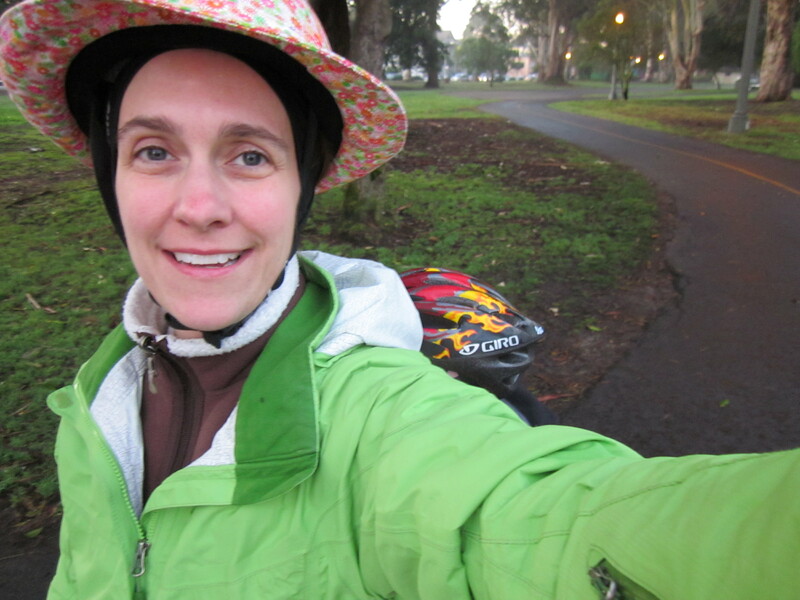 This is a very cool ride; in the early morning, when it’s still half-light, the park is still thin on other bicycle commuters and the trees hide the car traffic on either side. Our son can be very chatty on the bike, and he enjoys the view. He is sometimes irritated by the pannier encroaching on his foot rest, and the other day, he entertained himself by lightly kicking my calf on every pedal stroke. “I don’t want to ride with the pannier again!” he yelled. “I don’t want to shove a backpack in your face,” I answered. I forget what else we talked about, and now only remember that we were laughing so hard that we were bothering the joggers, who normally reside exclusively in iPod land. We learned later that one of his classmates saw us while driving by (we arrived at school only a minute later than they did, which still astonishes me). Her dad told me that she asked why she couldn’t ride to school too. 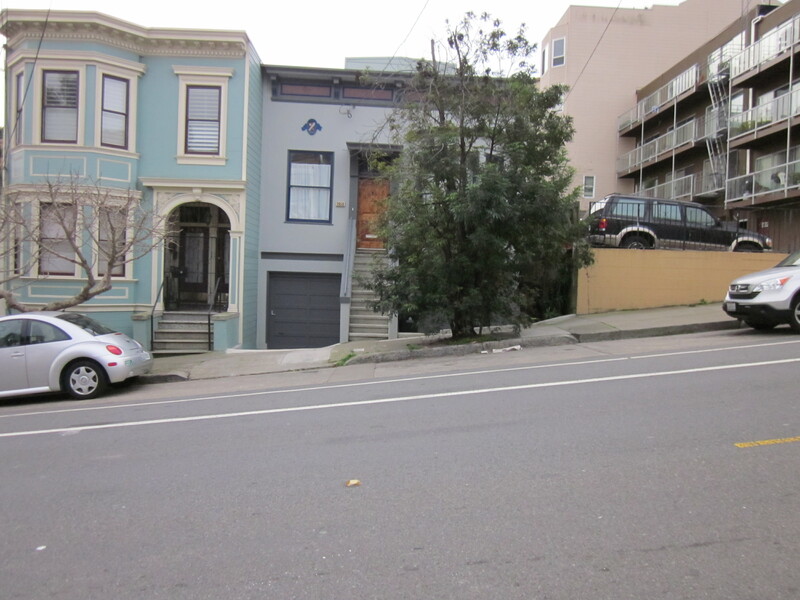 I like the way the Breezer takes the hills, so when we’re headed up to Alamo Square and the lights are timed right, we can jump up the incline pretty fast. That day we raced a garbage truck. We lost, but held our lead for longer than I expected, given that I had a 1st grader and his school gear on the back. After his drop-off I head up to work, taking the grim eastward approach to Laurel Heights, which packs all of the elevation in at once at Post Street, then drops me off at the intersection of California and Presidio, a nightmarish snarl that usually leaves me walking my bike through the intersection rather than attempting to ride it. Thank goodness I have a step-through frame: hit the red light, slither off to one side, walk the bike through the crosswalks, hop back on. I am still vaguely amazed that a seat like the Bobike Junior even exists. It solves an unusual problem; most parents with kids our son’s age would have them riding to school on their own bikes. Traffic and hills and the transition to after-school make that impossible for us, but I don’t think our situation is exactly typical. And yet thanks to the canny Dutch, we’ve found an out-of-the-box solution that’s both effective and a lot of fun. 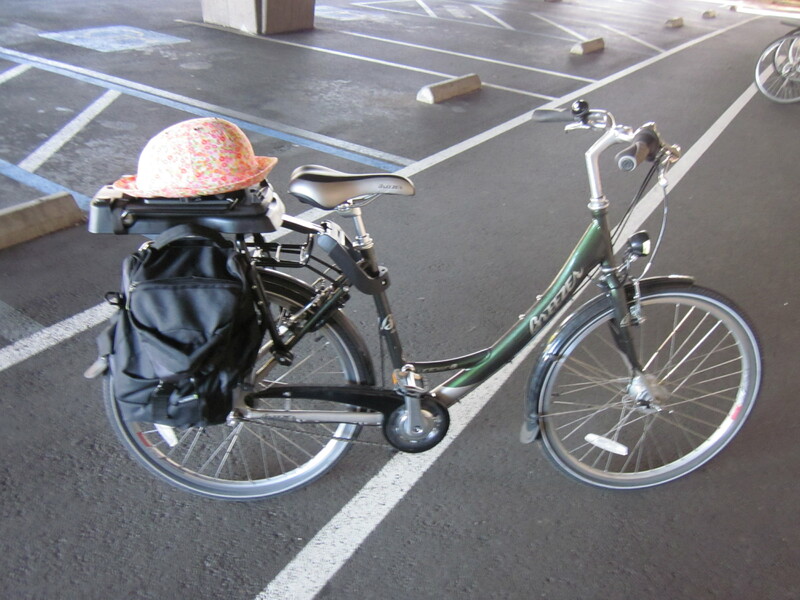 One idea to the pannier encroachment problem would be to get a front rack for your pannier – or a basket. I finally got a front basket a couple of months ago when I got a rear child seat that (when on the bike) makes my rear rack mostly useless. And I have to say I LOVE having a basket. No more hassling with bungee cords when I buy a few things and didn’t bring the pannier! Can’t believe I didn’t have a basket all these years riding in San Francisco. I have a wicker front basket that I use sometimes, but it doesn’t hold as much weight as the pannier–as things stand I can usually get a few days worth of groceries into the panniers without annoying my son too much (up to and including a carton of milk). I hadn’t considered a front pannier rack–great idea! Or maybe I should just upgrade to a better front basket? I’m going to be adding either a Bobike mini or Yepp mini to my Breezer. I, too, like its acceleration on inclines– but mines not loaded with a kid, yet! I think some riders avoid the hills, but a lot of people just get used to them. I’ve seen some bike commuters casually climb hills around campus that I’ve never even attempted. I guess eventually you get stronger? The Bobike and Yepp Minis are both great seats. And I’ve heard that Boston is even windier than San Francisco, so I’m sure it will be nice to have the windscreen. Hi there, we are looking at the Kona Minute and I wonder can you fit the Bobike junior seat to the Minute (preferably towards the back of the rack, so that another child could squeeze on in front)? Many thanks, Jen. Our two (now 3 and 6.5 years) kids ride directly on the deck, and we so never needed the Bobike Junior on the MinUte. If you wanted a back support for the rear child, you could just screw a folding camp chair (~$5) to the deck. If you look at pictures of two kids on the Kona Ute flickr page, you’ll see this setup a lot, usually with two camp chairs–people fold them down when the kids aren’t riding. The Minute deck might be a tight squeeze for two seats but one would fit easily, and the front kid would be supported by the back kid. I hope you find something that works for you! I was curious does the seat have a safety harness/belt? My daughter is almost 4 and I really want one of these seats as it will last much longer for us than the Bobike+ (which only goes till 50 lbs) .. and with it being a more expensive seat it would be a little silly to buy one and only a year or two later have to buy another … what do you suggest? Do you think with a helmet could a almost 4 year old ride on this seat safely? At four years old I suspect safety on the Junior would be personality-related. My son would have been fine, as he has a cautious nature. My daughter, now three, who lusts for danger? We’ll have to see. But she has opened a car door into moving freeway traffic as well, just to see what would happen (her parents screamed and now won’t drive any rental car without child safety locks is what happened). So we have some atypical concerns with her. Well, I had to look up the Schwinn Meridian because I had no idea what you were talking about, but the pictures suggest it’s possible–there are seat stays for the Junior seat-legs in the same place that a bicycle would have them. With the Meridian itself you might have to switch the stock rear basket for something shorter to have room for the attachments. That said I would take this question to a bike shop experienced with the Bobike if you can find one. We have yet to install a child seat ourselves; I’d rather leave it to the experts. Thanks for the kind words. When we started riding I had so many questions that no one could answer; it was very frustrating. If you had to choose between a Breezer uptown 8, a konw min ute and a novara fusion, which would you pick? I haven’t purchased a bike in over 30 years but now with an 18 month old, I want to get back out there for family rides around town! Wow, interesting question. They’re really very different bikes. I don’t know much about the Novara, but I’d probably rule it out because it costs more than the Breezer but lacks some of the useful features (front and rear wired lights, rear wheel lock), although it is definitely prettier. But if you’re looking for a pretty bike you could get a very nice Linus for less money, so I would probably go that route instead (and then ask the shop to wire up a front dynamo for the lights, but that’s me). I think my answer would depend on how I was using the bike and wanted to use it in the future. Either bike could take a Bobike/Yepp Mini seat for an 18-month-old. For a regular commute-focused bike+kid hauler, the Breezer is grab-and-go. With the lights, chain guard, on-board lock, and internal hub, I never have to worry about gearing up for a ride, rolling up a pants leg, and things like that. So it’s a good bike for riding to work hassle-free. But there is more effort involved in putting an older kid on board; you have to add the attachment points for a rear seat and possibly take the seat on and off. And the Breezer can’t carry nearly as much as even a smaller cargo bike. And no one will ever compliment on its looks except guys at bike shops. For cargo hauling, recreational rides (particularly off pavement), or if you know you’re planning to have a second kid, the MinUte is more versatile. At age 3 or so it’s probably safe to put a firstborn kid on the back deck, and then there would be space for a younger sibling in the front seat. And a nice feature of putting an older kid on the rear deck is that the seat is always available; you don’t have to worry about putting it on or taking it off like a seat. The stoker bars weigh almost nothing, unlike a Bobike/Yepp rear seat. The MinUte is faster and better at climbing hills. But it doesn’t have a chain guard or integrated lights, and comparatively speaking, that can be a hassle. On the other hand for doing regular grocery runs with a kid on board, the MinUte is better because it can haul more and has a real cargo kickstand. I wouldn’t like riding the MinUte as my regular commuter as much as I like the Breezer, but I prefer riding the MinUte on weekends. Upgrading the brakes on the MinUte would be a smart decision no matter what. All that said, if I lived someplace flat (or had been willing to put enough money into the question to retrofit with an electric assist), I would have seriously considered some kind of box-bike–bakfiets, Metrofiets, Madsen, etc. I think they are more fun for the kids, particularly when they’re young, and I’ve seen infant seats rigged in them as well. For 2-3 kids people who ride a lot start thinking pretty seriously about a Surly Big Dummy or Yuba Mundo, which have a lot more cargo capacity, but are longer and heavier. We would be more interested in those bikes if we didn’t live in a major city where they seem like overkill. Although I see both kinds of bikes around the neighborhood at times, it’s more common to see smaller and nimbler bikes around here. Do you have a local bike shop that has put together bikes for families? Our bike shop initially didn’t have a clue but has learned fast. They’ve now rigged up over a dozen family bikes, and they’re getting pretty good at helping people figure out what works for them. does the bobike junior seat come with a seat belt? Yes, but it’s just a lap belt. I was wondering if the Bobike Junior fit any bike? I purchased a rode bike and wanted to see if the bobike junior will fit it. I will send you a website link below this comment of the exact road bike I have. Thank you! I’m not sure. Our Bobike Junior attaches to the seat stays in the rear, and on the bike you link those look fine. In the front it attaches to the seat tube, which extends far enough above the crossbar that there is room to clamp on the attachment. The bicycle you link doesn’t seem to have as much room on the seat tube, so you might have to try to attach it to the seat POST, and I’m not sure whether that is kosher or not. I’d suggest (1) measuring the seat tube above the cross bar to see whether there is room to attach the Bobike clamp–you need a couple of inches–and if not (2) calling a shop like Rolling Orange in NYC that sells Bobikes (the attachment is the same for the Maxi and the Junior) and asking them whether it is legit to put the attachment on the seat post rather than the seat tube. Hi. I have a Bobike junior for my 4 year old daughter. I had the same issues with panniers but managed to modify a set i have and move the hooks closer together. we live in Scotland in the UK and also have plenty of hills so having her on her own bike is a no no. i was wondering how useful you have found the juniors fold down ‘rack’. I often strap a small bag to the back or my daughter has her little rucsack. i was wondering if there was a type of bag that could be fixed to it… similar to the rack top bags you can get. Have you any experience looking at this? I never found that back rack useful at all, sadly. If you figure out something useful to do with it, I’d be interested to know about it. I slip the top loop of my kid’s backpack onto the middle part of the rack just before it’s fully lowered, and let it dangle while we bike. I have no clue if this is the “right” way to use it though. Hello, congratulations for your blog! We are a family from Barcelona, Spain, living in Brooklyn, NYC. I love biking! I am considering riding my 5 years old to the school with a Bobike Junior. I don’t know if it’s possible to add some luggage bags at both sides to bring my computer and lunch. And what brands would be easy to untight from the back to bring as a backpack. That would be great. Also I don’t know if there are two kinds of Bobike Junior seats, folding and not folding. I would really appreciate your help, I am not fast yet reading in english so my research is slower because of the language barrier. Hi there! Congratulations on riding to school. (1) There is only one kind of Bobike Junior and it folds. (2) You would need a narrower bag (or a longer rear rack) to fit bags under a Bobike seat. I don’t know of any that convert to backpacks. So I would suggest a longer rear rack + folding metal baskets, and you could put regular backpacks in those. Check the blog Family Ride for pictures of her Bianchi, which was set up this way. (3) Another option is a large front basket to hold bags, which would not interfere with the rear seat. I’ve been using the Bobike Junior for over a year now for a daily school drop-off and work commute. In fact, this blog post was part of my research to purchase it! I have mine mounted above a rear rack, with about 4 inches of clearance. This gives me sufficient room to clip and un-clip Ortlieb panniers on each side. Ortlieb also makes a “pannier carry system” which allows you to carry a pannier as a backpack. I don’t have one, myself, but I’m interested in getting one for when we take the bike to a destination like a hike. Re: the back flip-down rack: I use this when I run out of room for groceries and just tie the bags to them. I love the idea of putting the backpack over the seat. seems like it might make him feel a little more secure. where does your son put his hands when you ride? does it just take some getting used too? any words of wisdom would be awesome. we have no other transportation option so I’m hoping I can ease his fears somehow. We haven’t used the Junior for a while, but yes, I do remember some early concern about the lack of a handhold. A couple of options: (1) my son would hold my waits for a while, (2) you can add stoker bars, or even just a stick, to the seat post to serve as handholds. Example: some friends of ours bungeed a piece of PVC pipe to the saddle of their Brompton so their oldest can squat on the rear rack and hang on to the pipe. The backpack over the seat is also a clever idea. Madi at Family Ride has also zipped her coat (zipper in back) over her kids to keep them in the seat. Apparently I spoke too soon – one day later (this morning) he was riding to school with his arms outstretched like a bird without a care in the world! I guess it was just beginning jitters. Whew!!! Cannot imagine zipping him into a backwards coat! Thanks so much for the advice!